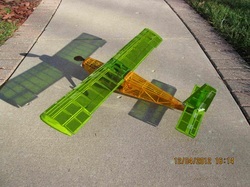 Helio Courier, My first RC Kit. My son gave me this kit for my birthday in October, 2012. It took me three months to complete on the kitchen counter. 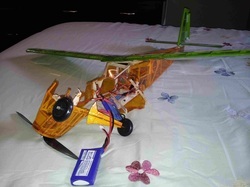 Originally designed to be a rubber band powered free flight model I converted it to radio control. To do that I had to add functioning ailerons, rudder and elevator. 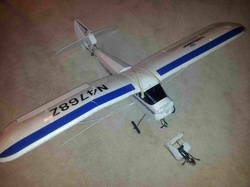 The plane was a static display model for months until I got up enough courage to try to fly it. As you can see on the right, that was a tragedy, reducing it to a pile of sticks when it nosedived into the ground. 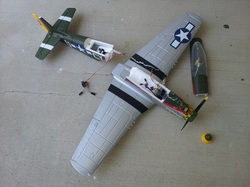 I'm sure that was 99% pilot error, including the decision to try it on a too-windy day for this extremely light model. The Horizon Hobby Super Cub is a wonderful and forgiving little plane. But as the photo to the left shows, even as gentle as it is, it's capable of being severely damaged. This sad mess is the result of the "just one more flight" syndrome when you kind of know now is a good time to quit. But a little glue, well quite a bit actually and packing tape got it going again. And if it is quite a ways up and the sun hits it just right, it even still looks sorta new! I just made a water rudder for it and am anxious to fly it off water with the Horizon floats to see how that works. At a family vacation in Minnesota a couple weeks ago I got to fly it off a lake using the floats and my home made water rudder. It flew very well. It was much easier to land than I expected but a bit harder to get into the air than I expected. That is not necessarily a fair comment on the plane as I had replaced the stock motor with a brushless one I had lying around. On the final flight (by definition I guess) a gust of wind caught it and it flipped on its back and before I could figure out what was happening it dove into the water. The damage was minor but the ESC and motor pair don't seem to work right any more and the cowl was damage. After getting it back home I re-installed the original motor and receiver and got a new cowl for about four bucks. This evening (7/16/14) I took it out to our flying field and flew it four times without event other than I had accidentally reversed direction on the ailerons which made for an interesting first flight! But tall grass and weeds are friendly and there was no perceivable damage and I flew it three other times. This plane is clearly a work horse and I recommend it to anyone. 11/14/14 Since writing the above this poor little plane has had several other mishaps. I got tired of the short flight time on the 1300ma batter so decided to modify it to take 2200ma one. Unfortunately that increased its gross weight considerably so that it would barely fly with the stock motor, or even with my brushless motor. So I installed a bigger motor (from the FT-Cruiser). Now it flies very well. Unfortunately playing around with it I nosedived it into the ground at full throttle and did more damage. I assumed it wasn't worth repairing but after looking it over discovered that for about $11 I could get a new motor mount, cowl and wing struts. I already had a spare wing from a friend so after a few hours work it is back in the air good as new. It just won't quit. It takes a bit more attention than in its original configuration but is still easy and fun to fly and now has more than enough power for almost anything. In August of 2013 I thought I was becoming a pretty good pilot, ready for something exciting, like a P-51. So I got my pretty little 39 inch Horizon Hobby P-51. The paperwork said it was a fast and responsive plane, designed to be hand launched. Well, the picture on the right shows what happened on the first flight! Indeed "Proverbs 16:18 (KJV) 18 Pride goeth before destruction, and an haughty spirit before a fall." My "fall" was crashing into a tree hundreds of feet from where we thought it should be! I leaned several lessons. 1) be sure you are up to the plane you are going to try to fly, 2) miracles can and do happen - we found this plane in the most unlikely of places and completely out of sight from any reasonable perspective, 3) foam CA and packing tape can fix almost anything. In fact packing tape is the "Duck Tape" of foam flying! On the right you can see that it is nearly air worthy again, this time with my home designed landing gear so I can take off instead of "suddenly" be flying via hand launch. It has had several more incidents but is still flying and is still fun in spite of its very responsive personality which often drives this inexperienced pilot to over react. Since writing the above I have learned that adding about 30% exponential to the ailerons makes it a lot easier to control. This is my Curtiss JN-4D "Jenny" by Dare Design & Engineering, Inc., Cumberland, MD. I actually built it in the Fall of 2013 but then kind of tabled it while working on the Cessna 170 and several other projects. But this past week I got it all done except for the decals and took it out for a test flight. After adding a lot more weight to the nose I had a really successful series of flights today (5/30/14). It is pretty touchy but once I got it trimmed out it flies quite nicely. Most of my landings were wheel landings with no mishaps. It still needs more weight on the nose I think. It has a very long tail but very short nose making it hard to balance properly. It needs a gentile hand on the throttle and controls as it is very responsive. I added ailerons. I just like the idea of full control!